PHILIPSBURG — Opposition members of Parliament made a song and dance about procedural matters in a meeting on Monday afternoon designed to examine – again – the credentials of substitute MP Jules James. Accusations against chairlady MP Sarah Wescot-Williams of misleading Governor Drs. Eugène Holiday and manipulating the agenda of Parliament from the opposition benches fizzled when the chair wanted to address these accusations during the closing of the meeting; all opposition MPs left, leaving the meeting without a quorum. National Alliance and United St. Maarten party MPs railed against a decision by the chair to appoint a committee to examine James’ credentials during a meeting last Wednesday while there was no quorum. Wescot-Williams however, noted that, when a meeting is called for the third time, no quorum in required. On Monday afternoon, thirteen MPs were present; one chair remained empty awaiting the entrance of substitute MP Jules James, while NA-MP Christophe Emmanuel did not show up. NA-MP William Marlin complained that the committee that had examined James’ credentials on Friday consisted exclusively of members of the coalition parties. The chair then appointed a new committee, consisting of MPs Franklin Meyers (United Democrats) Silveria Jacobs (NA) and Frans Richardson (USp). The committee needed all of two minutes to go through the paperwork and declare that the credentials were in order. Since there were no objections against the verbal declaration of the committee, a report about the findings will now be sent to the governor, to the chairman of the Central Voting Bureau and to Jules James, who will take his seat after he’s sworn in by the governor. Richardson and other opposition MPs like William Marlin, Rolando Brison and Silveria Jacobs emphasized that they are not out to block James’s appointment as a substitute member of Parliament. James will take the seat of MP Theo Heyliger, who is in pretrial detention on bribery-charges. Heyliger is suspended and James will take his place as long as the suspension continues. NA faction leader Silveria Jacobs said that she could not accept a report about the credentials from a committee that was not appointed by Parliament. Chairlady Wescot-Williams recapped the attempts to get James’ credentials through Parliament. The first meeting, on Monday March 25, had no quorum; the second one, on March 27 at 11 a.m. had no quorum either, so the chair convened a third meeting (that did not require a quorum) in the afternoon of the same day. The report from the committee that was appointed that day was sent to the governor, who noted in a reaction that there was no decision by Parliament about the credentials. Wescot-Williams said that Monday’s meeting was “a complete new meeting” in which she intended to appoint another committee to examine the credentials. MP Rolando Brison labeled the meetings as “an embarrassment to the country and to Jules James.” He listed a series of urgent meetings the opposition had requested and that still have not taken place. Among the topics for these meetings is the dump, the hospital, Mullet Bay and the contract with Bearing Point. 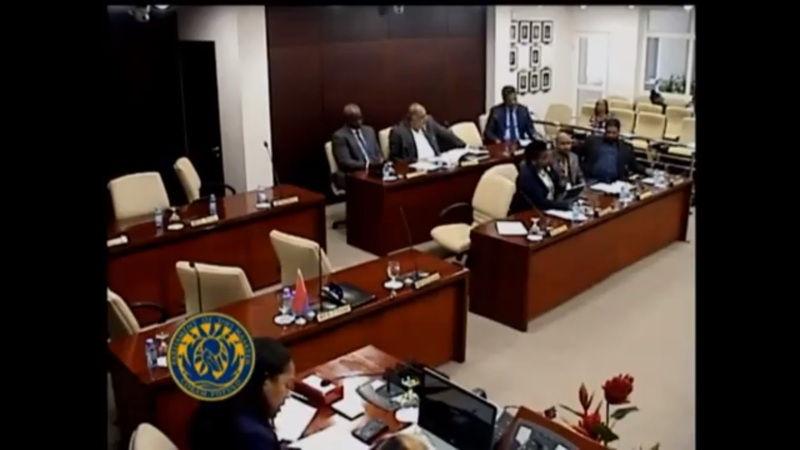 When Wescot-Williams was in the process of closing the meeting – and wanting to use the opportunity to address the accusations that had come her way – MP Frans Richardson objected to what he called “the chair taking the floor” after which he demanded a roll call. The members of the opposition left the meeting in a hurry, leaving seven coalition-members behind – one short of a quorum. Wescot-Williams said, before adjourning the meeting, that she would address the issues she had in mind “in a proper manner” at a later date.